Yet another archived review from the old Entertainment Insiders website. In the early 1970s the big three networks began producing weekly made for TV movies. In those pre-cable days, there was an incredible output of original films airing on a weekly basis. ABC led the way with 2 new films each week on their "ABC Tuesday (and Wednesday) Night Movie." Many of these old films were of such quality that they were released to successful theatrical runs in Europe. "Duel" by Steven Spielberg is probably the best know of the classic TV movies from the early 70s. I few months back I wrote a Video Risk column about some of these forgotten gems. There were several films that I omitted from that list because I couldn't find them on video. I didn't have a DVD player at the time. I do now. One of those films was the 1972 made for TV movie "Gargoyles." It came out when I was in junior high school. I never missed the chance to catch it on reruns. Thanks to VCI Entertainment, "Gargoyles" is available for your viewing pleasure. Cornel Wilde plays Dr. Mercer Boley, an anthropologist specializing in the religious rituals of primitive tribes and demonology. He is a cynic who makes a fortune on his coffee table books debunking pagan and superstitious thinking. He is joined on a research trip to New Mexico by his daughter, Diana (Jennifer Salt). As they drive along catching up on old times, Mercer tells her he has to make a side trip to investigate a letter he received. They arrive at Uncle Willie's Desert store. 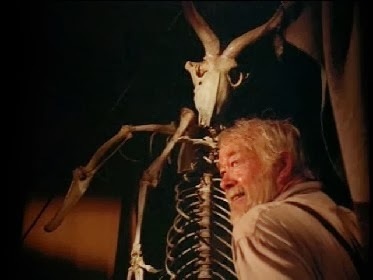 Uncle Willie (Woody Chambliss) spends a little time sizing up the good doctor before taking him to a storage shed which houses the skeleton of a man sized being with a birds head and wings. Mercer is impressed with Willie's ingenuity in creating the clever fake. Willie is indignant and wants the visitors to leave. Struck by Willie's sincerity and the fact that Willie hasn't tried to sell him the bones, Mercer agrees to hear the old desert rat out. As Willie speaks the shed begin to shake violently. It collapses and begins to burn. Mercer and his daughter escape but Willie is toast. Mercer and Diana drive to the sheriff's office but are attacked from above by a winged beast. Their car badly damaged, they pull into a gas station for repairs and check into the motel next door to wait. Needless to say Mercer and Diana have several more run ins with the leathery demons before the climatic man v. monster battle in an underground lair. Along the way we pick up various characters who provide laughs: Mrs. Parks (Grayson Hall) (as a gin swilling menopausal motel matron with the hots for Mercer), brawn, James Reeger (Scott Glen) (as a biker wrongly accused of Uncle Willie's murder) and fodder for the Gargoyles. The plot is not unlike a myriad of 1950's monster movies. The acting is good for this type of film. Cornel Wilde is an acquired taste. He is at times wooden and at others to intense for his own good. He appears to going through the motions in this one. (Check out "The Naked Prey" rerunning constantly on AMC for the ultimate Cornel Wilde film!) Jennifer Salt, daughter of screenwriter Waldo Salt is a good argument against nepotism. Annoyingly tolerable in "Sisters," her brassy Nancy Drew righteousness here makes you wish the Gargoyles would shut her up for good. Although I will admit that she looks great in her braless white halter top! 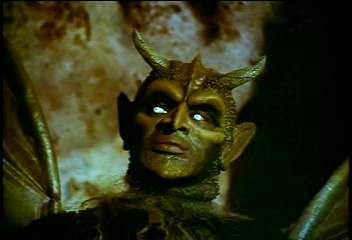 Bernie Casey gives a standout if unrecognizable performance as the leader of the Gargoyles. Richard Moll (Bull of TV's "Night Court") also appears as one of the beasts. Scott Glen also shows why he has had steady work for the last 30 years. His Colbyesque Reeger gets Diana's temperature rising and the Gargoyles knees knocking. What sets Gargoyles apart from countless movies of this type are the Emmy Award winning special effects by make up artist Stan Winston and Milt Rice. A lot of time, effort and creativity went into the creature's design. Like snowflakes, the are no identical Gargoyles. Each creature has a unique look. This also allows the actors to bring some dramatic creativity to their portrayals of the beasts. Yes, they are threatening, however they also are loyal and protective of each other. As the Gargoyle leader argues with Mercer about mankind's right to wipe them out you feel sorry for them (forgetting that they are descendants of Lucifer intent on wiping us out!). Not a lot of extras, but worth it for the movie alone. Great picture, good sound. A chessy classic from the golden age of "Made for TV" movies. Good job. Nice to see that VCI put a Dolby Stereo track on the disc considering the movie was made for TV nearly 30 years ago. Nothing special. It is easy to navigate. I'm glad VCI puts photo captions on their chapter stops. Some folks don't. I like them and believe most DVD fans do too. Trailers for Mario Bava's "Blood and Black Lace" Dario Argento's "The Bird With the Crystal Plummage" "Gorgo" and "The Night Visitor." The bios are informative and fairly indepth. A commentary or featurette by Stan Winston would have been nice. Some good trailers of other VCI horror movie products. This was one of my favorite films in Junior High school. Nostalgia factor aside, "Gargoyles" holds up well. Fans of the genre will enjoy. This movie is well worth the price of admission. A keeper, not just a rental.